How to get there: The mountain is located between Skei and Byrkjelo. The main access road is E-39. Driving time from Bergen is approximately 4 hours. There are two routes, one from the south, one from the north-west. South route: Drive north from Skei (at the end of the Jølster lake) or south from Byrkjelo and locate the road going east into Stardalen. This little place is called Klakegg. There is good parking right next to the intersection on the east side of the road. 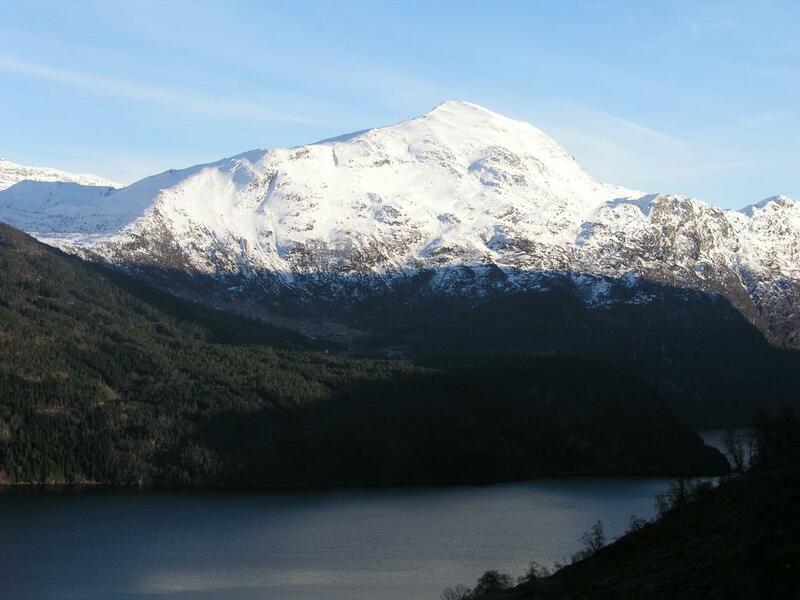 North-west route: Drive to Byrkjelo and continue E-39 west to the lake Breimsvatnet. Go south along the east side of Breimsvatnet to the last and highest farm. Route description: There are two obvious routes, as we traversed the peak, they will be described from south to north (west). With summer conditions, the route from north-west is the easier and shortest approach. 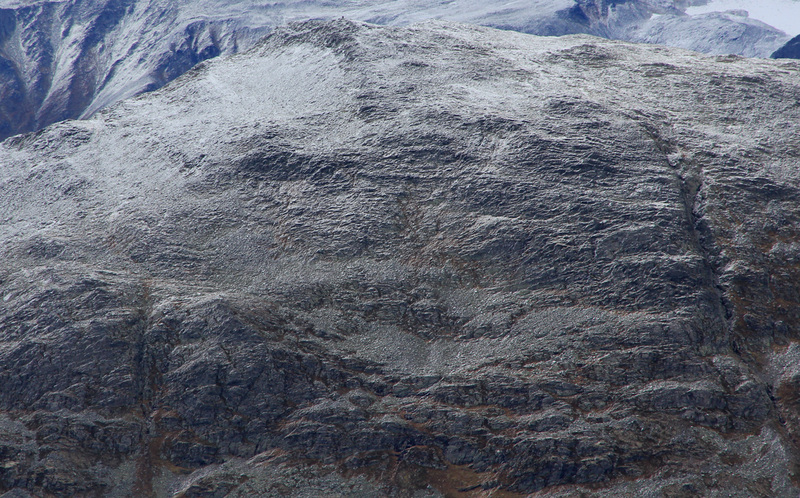 However, in winter the north ridge of the peak may be icy and considerable care must be taken as the drop to either side of the ridge is significant on the upper part. 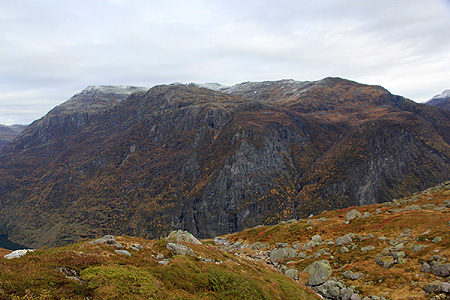 From the farms at Klakegg, head straight up across the farm area. Do follow established paths or farm vehicle tracks, do not walk on agricultured land. In late fall and winter, perhaps the easiest is to hike along a distinct stone fence that stretches straight uphill. At the upper end of the fields, follow clear tracks to the left, a bit higher and just between the fields, a fence and the forest, you will locate a trail that heads up through the otherwise quite dense forest. Follow this trail as it climbs more or less straight uphill. Higher up, when leaving the trees behind, you will see a very distinct cliff a bit to the left. The trail will climb just to the right of this feature, then turn a bit left and gain the higher ground above the cliff. There may be a couple of short stretches that require the use of hands for support, easy class 2+ terrain. Further up, one can continue up below the upper rocks, the best route is likely to do an ascending traverse on the left (west) side of the horizon (see also the picture below). Comments: I did this hike with my friend and coworker, Jacko Koster. We started at 0930 after an early departure from Bergen. We had rain, higher up snow and dense fog. As this was Jacko's debut at (serious) mountaineering skiing and with somewhat less than ideal conditions, our climb took longer than what would be a normal time. The cairn on the summit is unusually big and very nicely built. We reached the summit at 1620 as darkness came. 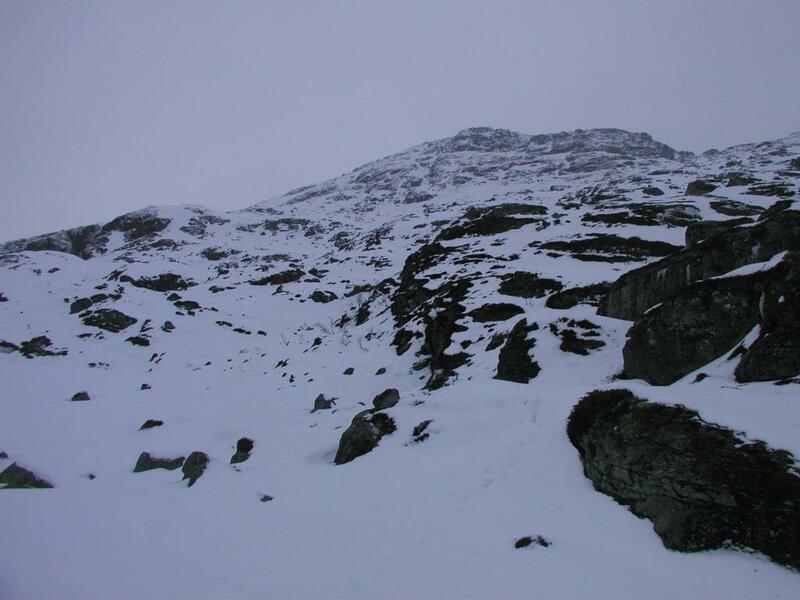 We scrambled ' down the north ridge with care and reached the highest farm above the Breimvatnet lake at 1920. Fortunately, our friend Arnt was there to pick us up. 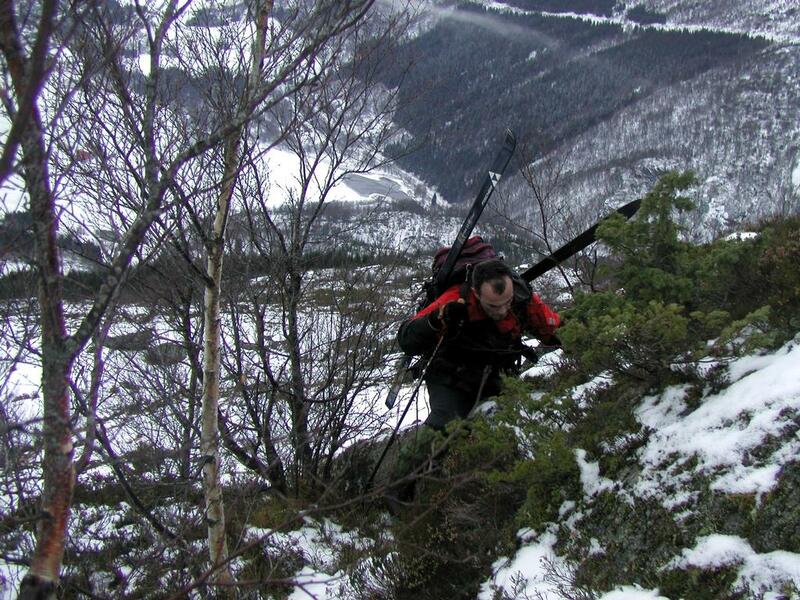 The climb was then celebrated with dinner and a good night at the Skei hotel. Daurmål from across the lake Breimsvatnet, February 16, 2003. Jacko in the lower section of the mountain. The upper part of the initial climb. We skied in zig-zag more or less straight ahead, then contoured around below the upper part to the right (east). It is likely better to continue the ascent on the left (west) side of the upper part.